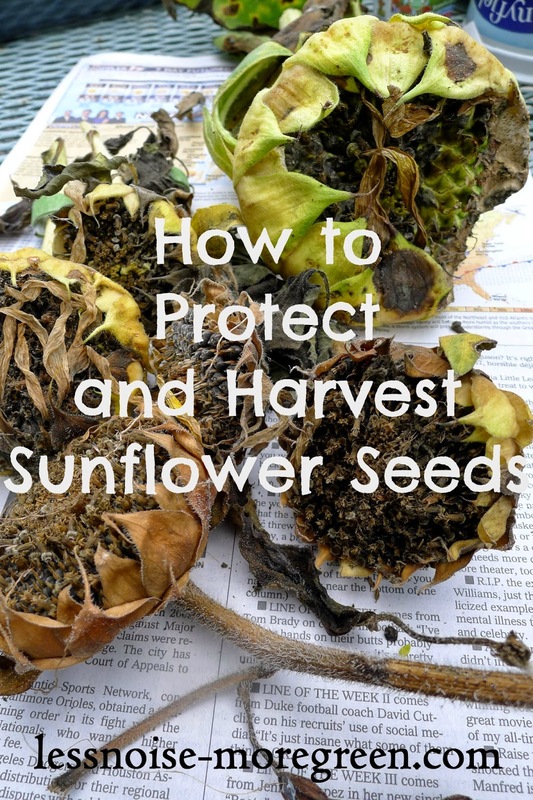 I grew Sunseed Sunflowers in my new front yard edible landscape this year. They did not grow very tall and bloomed quickly but they brought me joy every time I saw them waving in the breeze. I grew them not only for their beauty but for their edible seeds, which this variety is known for. Bringing these seeds to maturity and harvest, however, was going to be challenging and would write another chapter in my ongoing "Gardener Verses Squirrel" Saga. I think the sunflowers were so small because they got off to a late start. The new garden installation pushed my planting date back and then the seedlings were all eaten as soon as they pushed through the earth. I smartened up and grew the next batch indoors, planting them out when they were big enough to survive. Sitting on my neighbor's fence having a feast was my gardening nemesis, Mr. Squirrel. A quick inspection revealed half eaten sunflower heads and knocked over plants. It was time for action. The solution, unfortunately, was to protect the heads by covering them. Each pretty head was covered with a paper bag and tied in place. Not exactly attractive. In fact, a neighbor asked me if they were a Halloween decoration! Not a bad idea for next year, though! Some of the heads had already lost their petals and the backs were starting to turn brown, indications that the heads were starting to dry. If wanted to harvest any seeds, I had no choice but to bag 'em and tag 'em. After a few weeks, I checked under the bags and all the heads were intact and drying. I cut the heads from the plants and brought them inside to hang upside down for another week. Removing the seeds was as easy as rubbing my fingers over the heads. Roasting sunflower seeds for a snack is very simple. I roasted mine in their shells, but you can remove the shells if you want. Some people soak the seeds in saltwater before drying and roasting, but I didn't do that, I just baked them in a single layer at 300 degrees F for forty minutes. I added a little butter and salt. Done. The other treat I have deprived the local squirrel population of is my peanut crop. As the first frost date approached, I dug up the plants, shook off the dirt and hung them up to dry for a few weeks. Last year I made peanut butter. It was so good I'm sure we'll do the same with this harvest. Living in an urban area I am lucky to only really have to deal with a couple of problem critters. Squirrels are my biggest worry. We try to outsmart each other, Mr. Squirrel and I, both claiming small victories along the way. I learned from my mistakes with last year's peanuts and protected them this year but Mr. Squirrel outsmarted me with the sunflowers. Next year I'll be ready for him. It's all part of the fun.